Today, 5th June 2013, there is a 'general strike' in Turkey. It is expected that about half a million workers will take part in the strike, which has been organized by five of the 'left' unions, KESK (public sector) DİSK (private sector), EĞTİM-SEN (educatıon), TTMOB (chamber of engıneers), and TOB (chamber of doctors). Since last Friday there have been hundreds of demonstrations in 67 of Turkey's 81 provinces, millions in the streets, at least two people killed, and thousands arrested. How did this situation emerge in a less than a week? How did a small demonstration against development in a park in İstanbul become a blaze that has burnt across the whole country, and brought in such a huge amount of people. To understand it is necessary to look at some of the background detail. Of course, it is not the building of one supermarket that has inflamed the whole country. The events in Gezi Park have acted more like a spark to an already existing tinderbox. There are five main causes behind the current conflagration. • Police Brutality: Probably the most immediate cause was the brutality used by the police in evicting the anti-development protestors in Taksim. The Turkish police have a long history of brutally attacking demonstrators, and of launching into incredibly violent attacks even on tiny peaceful demonstrations. Over the last few years, this seems to have become even worse with gas and water cannon now being the preferred method of dealing with situations as different as huge Mayday marches, unruly football fans, and small environmentalist protests. It is the reaction to this sort of violence that seems to be the thing that ignited the situation. • Taksim: Taksim square itself has a special place in the history of the working class and the left in Turkey. It is the centre of İstanbul, the traditional location for Mayday marches, and it was here in 1977 that 42 people were shot dead, and 220 injured on Mayday. In recent years, with one notable exception marches have been banned from The square, and there have been large scale street battles as people attempted to reach it. Taksim has its place at the heart of the Turkish left, and perhaps even worse than the building of a supermarket there is the governments intention to construct a mosque. • Creeping Islamicisation: The ruling Justice and Development Party (AKP) is the direct descendent of the Welfare Party (RP), which was forced out of office in 1997, in what is known in Turkey as a post modern coup. The following year, the party was banned for violating the constitutional principles of secularism. It has been in power, increasing its majority in each election since 2002, and in the 2011 elections, it scored an overwhelming 49.8% of the vote. Over this period, it has slowly whittled away at the secular system. The most well know example has been headscarves in universities, but recent examples including restrictions on the advertising of alcohol, and its sale in shops, lowering the age of admittance to religious schools, and announcements on the Ankara metro warning couples about kissing in public. There is widespread feeling across the country that the government wants to turn Turkey into another Iran. Another thing that has deeply upset members of Turkey's largest religious minority, the Alevis is the name that has been chosen by the state for the new Bosphorus bridge. The name of the new bridge, which is so controversial that even the company building the bridge has been reluctant to use it calling it merely 'the third bridge' is to be the Sultan Selim bridge. Sultan Selim, known as 'Selim the Grim' in English, was responsible for widespread massacres against Alevis and other Shia Muslims. It is almost the equivalent of naming a bridge in Iraqi Kurdistan the Saddam Hussein Memorial Bridge. •Regional Policy: Probably the two most important facets of Turkish policy have been the peace deal with the PKK, and the support for the Syrian rebels. Of course secularists are unhappy with the governments support for an Islamicist opposition against a secular state, and stray missile, bombs, and masses of refuges have brought this home. The government's peace deal with the Kurdish nationalists has also brought disquiet to Turkish nationalists of both the left and the right wing varieties. The Turkish Communist Party's Central Committee statement of June 4th makes it clear that the Turkish national flag is 'in the hands of the people', that the Kurdish nationalists shouldn't make a deal with the AKP, and that they should become a part of a 'united, patriotic, and enlightened people's labour movement' presumably waving this blood soaked flag as they do. • Workers' Struggles: the last few years have been relatively peaceful since the large movement centred around the TEKEL struggle in winter/spring 2010. However, recently there has been a marked increase in militancy, which has seen important strikes in the textile sector and south coast ports. Turkish Airlines have been on strike for two weeks, and even before these events exploded, KESK's 240,000 members were due to strike today anyway. In addition to this the 110,000 strong metal workers union is due to hold a strike towards the end of the month. When all of these things are wrapped together in Tayip's autocratic abrasive style of semi-imperial rule, it is not a surprise that things erupted as they did. 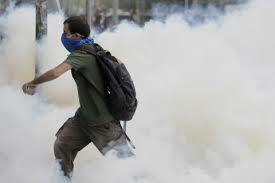 After the initial attack by the police in Gezi Park demonstrations spread quickly across the country. In the beginning spontaneously with people just coming out into the streets. Newspapers and TV channels close to the government played down or even barely reported on the issue, but word spread quickly through Twitter and the Internet, prompting Prime Minister Tayip Erdoğan to call social media 'the worst menace to the country'. Twenty four people have since been arrested for the 'crime of posting on Twitter. The main opposition party the Kemalist Republican People's Party (CHP) organized a large demonstration to march to Taksim, and other protestors, not put off by the closure of the metro, marched across the Bosphorus bridge in their thousands to join the protests. On the morning of June 1st Tayip was declaring that the police were in Taksim to stay, but by 15.45 of the same day they started to withdraw from the square leaving the protestors in control. In other cities the protests turned increasingly violent with police in Ankara dropping tear gas from helicopters, and killing at least one protestor when trying to move demonstrators from the central square. Other major cities across the country have also seen massive demonstrations with at least one more fatality, in Antakya. In Tunceli there is also a rumor that a protestor has been shot dead. In Izmir the AKP offices were set on fire, and the entire country from major cities, not only in the centre but also in the suburbs, to smaller towns. The protests seem to be a cross-class movement bringing in all of those who feel anger against the regime. All sorts of political groups are represented there from the far left to the far right. In Taksim square banners with pictures of imprisoned Kurdish Workers' Party (PKK) leader, Abdullah Öcelan have been unfurled as well as people waving Turkish flags, and even making the Grey Wolf (Turkish ultra-nationalists ) salute. What of the Working Class? Of course a mass movement such as this one can't move forward without the power of the working class. Calls for a general strike for Monday started to circulate on Twitter and Facebook on Sunday night though there never seemed much of a chance that they would be taken up although some universities in Ankara and Istanbul did start a strike on Monday along with some hospitals in Ankara who declared they would only deal with emergencies and demonstrators. The 'left' unions met on Monday to decide upon there response. KESK changed its already organized one day strike to a two day strike on Tuesday and Wednesday, and DİSK, EĞTİM-SEN, TTMOB, and TOB agreed yo join them on Wednesday with large scale demonstrations being organized in the three biggest cities, İstanbul, Ankara, and İzmir. Although these organization between them claim easily over one million members it seems reasonable to expect around half a million people to be actually on strike today. An opposition group within the main TÜRK-İŞ union confederation has also issued a statement calling on their members to support the struggle by a long list of methods, the last of which is actually striking. In the protests around the TEKEL dispute three years ago, it seemed that the movement lost its momentum after the general strike. Workers struggled for months occupying the centre of Ankara, and organizing countless demonstrations, to force their union to call a general strike. When it finally happened, it seemed like nobody had any plans to take the movement forward. With today's general strike as with that one the real question is what happens tomorrow.